On Thursday, January 26th, a hearty and fragrant Italian soup, Pasta e Fagioli was on the lunch menu at Lodi Unified School District. It was freshly prepared and made with California-grown food, including whole grain pasta and heirloom beans grown at a ranch farmed continuously since 1855 by a California family. Students devoured it. This tasty meal – like many other delicious, kid-tested recipes served across the state – is part of the California Thursdays program. A collaboration between the nonprofit Center for Ecoliteracy and a network of public school districts, the program supports improving school food by preparing meals using real ingredients sourced from California, including proteins, grains, fruits, vegetables, and dairy. It’s a big effort with a big network. 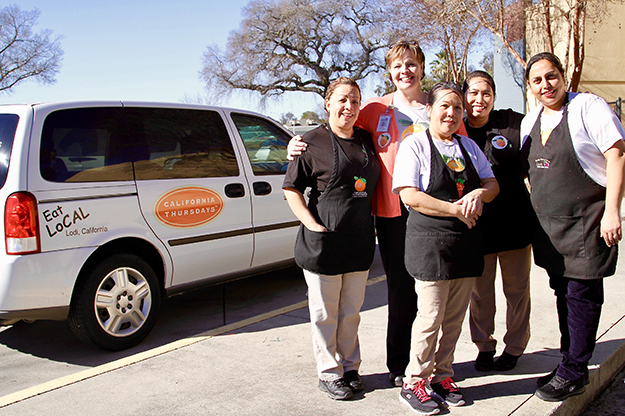 With seventy-one districts, including more than 2,900 schools, 1.85 million students, and 11,600 nutrition service staff, the California Thursdays Network collectively serves over 309 million meals each year. That is almost one third of the state’s nearly one billion school meals. Lunch on January 26th, however, was special. It was a “Collective Action Day,” where the network commits to serving their California Thursdays meals on the same day to demonstrate collective impact and to celebrate the abundance of California agriculture. On this particular Thursday, more than 500,000 students around the state enjoyed a tasty, healthy California Thursdays lunch. 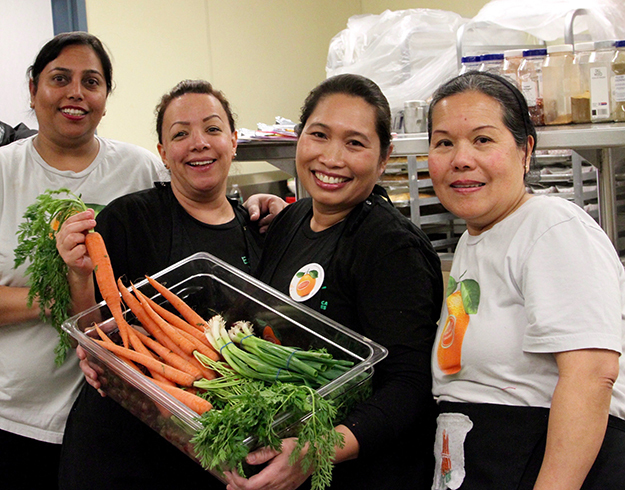 Nancy Rostomily, Lodi Unified School District’s Director of Nutrition Services, and her team had been planning their Collective Action Day celebration for months. In addition to the procurement and menu development necessary to create a new dish that would be rolled out to 58 schools, Nancy also invited farmers, producers, and distributors to join them for the day. Many were directly responsible for providing the food on the lunchtime tray. Students had a chance to meet “their” farmers and understand exactly where their food had come from. 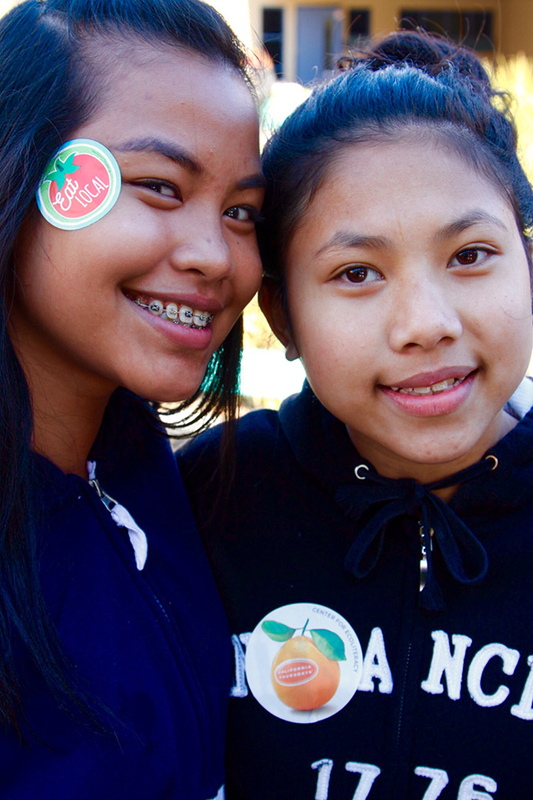 Special guests, from elected officials to celebrity chefs, also visited California Thursdays schools across the state. Lodi Unified School District was honored to host Jim Houston, Undersecretary of the California Department of Food and Agriculture, and Kamal Bagri, Assistant Agriculture Commissioner for San Joaquin County. “It’s great to see the level of commitment everyone has taken to make California Thursdays a success. There is a lot of hard work that goes into scratch cooking, but it is worth the time and effort,” remarked Houston. While developing their Pasta e Fagioli soup (pasta and beans), Nancy and her team certainly kept the source in mind. With whole grain pasta from Community Grains and heirloom beans from Mohr-Fry Ranch, just down the road in Lodi, it could hardly be more fresh and local. The dish embodied the multiple “wins” of California Thursdays: to nourish students, steward environmental sustainability, support the local economy, and connect students to their local food systems. Like so many others around the state, students left Collective Action Day nourished, engaged, and excited about their next California Thursdays meal. This entry was posted in CA Farm To Fork website on February 14, 2017 by California Farm to Fork.